Police officers have been the subject of movies since the beginning of the medium. However, the way in which law enforcement is viewed has certainlly changed over time. The silent era of the early 20th century brought us the "Keystone Kops", a group of bumbling, incompetent policeman which played everything for laughs. Today, this sort of treatment would be deemed as inappropriate. And yet, movies are allowed to portray cops are being dirty and unethical. Is that more insulting than policeman who are funny? I think that I'd rather be a funny cop than one who broke the law. Well, there's certainly nothing funny about the dirty cops in Triple 9. Triple 9 opens with a daring daytime heist in which a group of armed men rob a bank. Following their getaway, in which a dye-pack stains them all red, we learn that the men -- Michael Atwood (Chiwetel Ejiofor), Marcus Belmont (Anthony Mackie), Russell Welch (Norman Reedus), and Franco Rodriguez (Clifton Collins Jr.) -- are all cops. They have been joined by former policeman Gabe Welch (Aaron Paul), Russell's brother. The goal of the robbery was to steal something for the Russian mob, who is controlled in the area by Irina Vlaslov (Kate Winslet). While Jeffrey Allen (Woody Harrelson) sets about investigating the robbery, his nephew, Chris Allen (Casey Affleck), who is also with the police force, has transferred to a new unit and he's partnered with Marcus. When Irina requests that the gang pull off another crime, they realize that they will need a big distraction and putting one of their own in the line of fire will certainly do the trick. On paper, Triple 9 appears to have more than a fighting chance. Just look at that cast. That's quite a collection of movie and television stars, most of which are very recognizable faces. Director John Hillcoat hasn't necessarily directed a hit, but his previous works The Proposition, The Road, and Lawless have received good notices and the latter two featured some well-known stars. In addition, Hillcoat has continued to work tirelessly in music videos. These are the kinds of things which would draw viewers to the film. And it's every other part of the movie which will drive them away. Triple 9 opens well enough. The bank heist is well-shot and while it doesn't scream originality, the use of the dye-pack and the way in which it turns everyone red is certainly visually interesting. However, the movie goes straight downhill after that. Many of the issues with the movie lie in the script by Matt Cook, and, by default, the way in which Hillcoat has decided to interpret that script. For starters, the story is far too vague. The Russian mob runs Atlanta? Really? We could have used some more information on that. The reasons why the cops are beholden to Irina is not all that clear. Maybe vague isn't the right word. Much of the story is so surface and hackneyed that maybe I've made a mistake by looking for too many details. All of the characters are stereotypes -- the ambitious young cop, the burned-out older cop, the father desperate to get his son back, the burnt-out cop, etc. -- and no one's backstory is fleshed out. The film moves from scene-to-scene with little flow. By the time the crooked group's final plan is devised, the one in which explains the film's awkward title, most viewers won't care about what's going on. Again, at this point in history, for a police movie to be interesting and engaging, it must either present an original story or ground-breaking action. 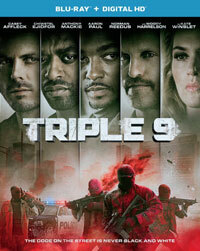 Triple 9 offers neither. We've seen crooked cops before. We've seen bank heists before. We've seen double- and triple-crosses before. I think that the movie thinks that it's doing something new by having a female mob boss, but that doesn't feel fresh either. Also, the film feels like it's lacking in research as well. One of the key factors in the opening is that the getaway creates a traffic jam. Have you ever driven in Atlanta? That entire city is a traffic jam! Boring and uninspired, the biggest crime in Triple 9 is the waste of the cast. Triple 9 shows that Jesse Pinkman has really let himself go on Blu-ray Disc courtesy of Universal Studios Home Entertainment. The film has been letterboxed at 2.35:1 and the Disc contains an AVC 1080p HD transfer which runs at an average of 34 Mbps. It appears that Hillcoat shot some of the film using natural light sources. There are some moments in the nighttime scenes in which the screen becomes incredibly grainy and we get red video noise. These defects are impossible to ignore. The daytime scenes look much better, as the picture only shows a trace amount of grain. The colors look good in these scenes and we get a nice amount of depth. But, those awful dark scenes ruin everything. The Disc carries a DTS-HD Master Audio 5.1 track which runs at 48 kHz and an average of 34 Mbps. The track provides clear dialogue and sound effects. The stereo and surround effects during the action scenes work well, as we are treated to some nice, distinct sounds. The chase through the apartment building offers sounds coming from off-screen. The subwoofer effects also work well, punctuating each gunshot and explosion. The Triple 9 Blu-ray Disc contains only a few extras. We begin with four DELETED SCENES which run about 8 minutes. We get two extra scenes with Woody Harrelson and a slightly alternate version of the ending. "Under the Gun" (3 minutes) is an very brief EPK where the actors comment on the story and the themes. "An Authentic World" (3 minutes) is another short EPK which is dominated by clips and offers the cast talking about the work which went into creating the look of the film.